South Africa’s parliament will on Thursday, February 15, 2018, elect Cyril Ramaphosa as the new president at 2 pm local time, 1200 GMT, and have him take the oath of office, the ruling African National Congress chief whip said in an interview with journalists. “The office of the chief justice has made itself available to officiate in the business of electing a new president,” the ANC chief whip, Jackson Mthembu, told a parliamentary committee meeting. At the same meeting, the speaker of parliament said a letter of resignation from President Jacob Zuma, who stepped down late on Wednesday, February 14, 2018, rather than face a no-confidence vote from his own party, was “still on its way”. South Africans awoke to a nation without Zuma as president for the first time in nine years on Thursday, released from the burden of a compromised leader who darkened the dreams and aspirations of the post-apartheid. Experts said the road back to prosperity and self-respect will be long and hard in a nation so divided by race and inequality but Zuma’s ultimate demise proved the enduring strength of its institutions, from the courts to the media and the constitution. Zuma reluctantly resigned as head of state late on Wednesday on orders from the ruling ANC, bringing an end to his nine scandal-plagued years in power. The 75-year-old Zuma said in a 30-minute farewell address to the nation he disagreed with the way the ANC had shoved him towards an early exit after the election of Deputy President Cyril Ramaphosa as party president in December but would accept its orders. “Defiant in defeat” and “Going, Going, Gone” were some of the newspaper headlines that captured Zuma’s reluctance to leave. “South Africa’s long nightmare is over,” read the headline of an analysis on online news site Daily Maverick. Ramaphosa, the interim head of state after Zuma’s resignation, is widely expected to be appointed by parliament as permanent president until elections in 2019. The rand currency, which has gained ground whenever Zuma hit political turbulence, soared to a near three-year high against the dollar on Zuma’s resignation. “One chapter in South Africa’s political soap-opera has finally ended with the resignation on Wednesday night of President Jacob Zuma,” NKC African Economics analysts wrote in a note. Zuma’s resignation came just hours after police raided the luxury home of the Gupta family, Indian-born billionaire allies of the former president who have been at the center of corruption allegations against Zuma and his circle for years. The post New South Africa President To Be Elected Today – ANC appeared first on The Trent. 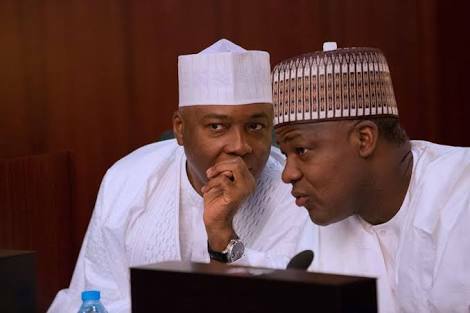 Speaker Dogara Set To Join Saraki In PDP?